Every Wednesday here at Modest Money I like to provide blogging tips. Yeah I know this is a finance blog, but early on most blogs have a lot of blogger traffic. So I want to help them all out. Besides, anyone who is looking to improve their finances may be considering starting an online business. Last month I published a very popular blogging tips post about optimal keyword research for SEO. In that post I detailed how to use the Google AdWords keyword tool to find great keywords to target. This is the follow up post about properly using keywords on your blog. If you run a blog, it’s a given that you want more traffic. For some reason hitting the publish button on your first post just didn’t give you the flood of traffic that you were expecting. That reason is a little thing called SEO. One of the most important components of SEO is choosing suitable keywords and properly using them on your blog. Google usually can’t figure out what your posts are most relevant for without some help. So now that you know how to research suitable keywords (if you read my previous post), how do you actually use those keywords to influence Google and other search engines? A long time ago, SEO used to be just a matter of using keywords as frequently as possible. People came up with all kinds of tricks to stuff keywords everywhere they could. Search engines eventually caught on and started penalizing such strategies. So these days it is about more subtle keyword usage. This means that you can still write for your visitors while keeping search engines happy. If it starts to read unnaturally, you’re probably overusing your target keywords. Post Title – The title of a page is the most important SEO element for a page. Usually it reflects what the entire page should be about. So any keywords used in the title are given extra weight. The closer to the beginning of the title, the more important the words are assumed to be. To prevent from keywords being diluted, try to keep your title under 75 characters long.One of the other reasons it is important to use keywords in your post title is that the title will often be the link text when other people link to your post. The keywords in link text are even more important than any on-page elements.Also remember that an intriguing title will play a huge role in click-thru rates. So try to balance good keyword usage with wording that will get clicks. Post URL – If you include your keywords in your post title, it normally gets included in your post url too. Having keywords in your url has a similar weight to having keywords in your post title. Just like the title, you don’t want to dilute things and use too many keywords. I personally try to limit the filename portion of the URL to 4-5 keywords at the most. Also like your post title, you will often get links to a post with the post URL as the link text. A common example is a tweet on Twitter. So it is another way you can help influence which keywords are in your backlinks. This means that if your blog is setup with post URLs like myblog.com/?id=1234, you are at a big disadvantage. Switch your permalink URL structure. Make sure you use a plugin that automatically sets up redirects from your old URLs though. Page Headings – With most blog themes your post title becomes a H1 heading, which takes care of that for you. If you have a plugin such as All In One SEO Pack, you may be tempted to use different text for your main heading than what is in the page title. This kind of variation may be good for SEO, but I would still try to use your main target keyword somewhere in that heading. It is believed that text in headings is no longer important to Google after too much abuse. That might true, but I still include it in there for any other search engines that still put weight on headings. For those search engines, using variations of your target keyword in H2 or H3 headings may be beneficial too. Some people may use your heading text as backlink text, especially if you don’t have an automated social sharing plugin installed. That alone is enough reason to use your keywords in your headings. Post Images – This is especially important if you use your own unique photos. Associating strong keywords with your photos can lead to additional image search traffic. I usually try to put my target keyword phrase in the image filename and image alt text. If image search traffic was a bigger priority to me, I would also try to put target keywords close to the image in the html code. For a finance blog though, image search traffic is very low quality traffic. Bold or Italic Text – This is another on-page factor that used to be much more important, but now its effectiveness is questionable. Since some other search engines may still be using it, I sometimes use this technique when optimizing a page. You can also add colored text into this group. Certain color fonts used to significantly help rankings. I doubt it is still used by any search engines, but it might still be worth fitting in when it can be done seamlessly. Main Post Content – Of course you want to use your target keyword at least once in your actual post content. If your title and other elements use a certain keyword phrase and it doesn’t appear in your main content, the relevance looks faked. Search engines like to have relevance reinforced. The old rule of thumb was to use the keyword phrase once near the beginning of the page, at least once in the middle and once towards the end. I don’t know if this is still applicable, but using it at least once or twice should be fine. Remember that this keyword usage can turn into your post excerpt that appears in the search results. So you might want to use appealing text around the keyword phrase. 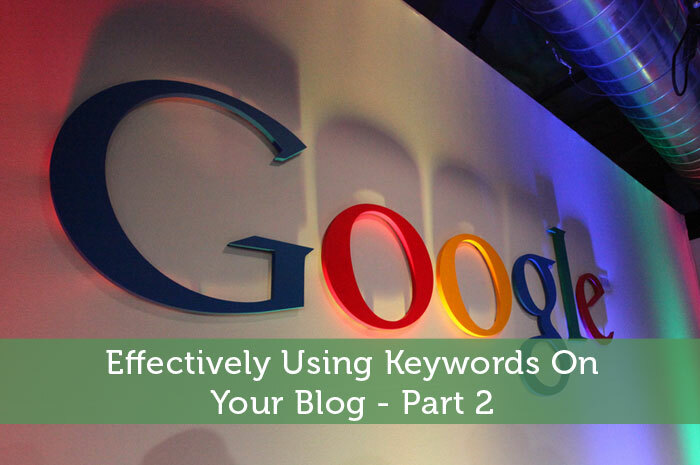 Knowing where to use keywords on your blog is part of the SEO battle. Ultimately what happens off-site is more important though. In the third part of this post I will cover how you can use keywords off-site to help your SEO. Also I’ll cover some advanced strategies for using keywords to your advantage. If you want to read more, be sure to subscribe to my RSS feed. If you find this series helpful, it would be much appreciated if you could share it socially. When you write a post do you make a point of including a main target keyword in important areas of your post? Do you largely ignore keyword optimization? Thanks for the tips Jeremy! So far in my posts I haven’t been thinking about putting keywords in important target areas. Mostly because I wasn’t sure what would make a difference where and that kind of thing. Now I have some ideas though. Also, I thought I could maybe go back and update posts after the fact, or does that not work? Is it a one shot deal, once you publish a post that’s what you get? Thanks again for the tips. Loving my RSS reader. I wouldn’t worry about keywords too much in the first few months of running a blog. If you have a particularly popular post that has a bunch of links, it probably would be worth optimizing after the fact. You can always optimize existing pages to try to make them more relevant. If it’s an older page with few links, it probably isn’t worth the effort. For brand new posts it is fairly important since it would have a link from your homepage. These are some great tips. During my first (failed) attempt at writing a blog, I really tried to learn all I could about SEO. This time around, one thing I’ve found to be really helpful is a plugin called WordPress SEO. It has really helped to focus our blog on being relatively SEO friendly. Of course, this particular plugin is only abailable for WordPress users, but I would assume that there are other plugins available for those who use other blogging sites. I would highly recommend this plugin for any beginning blogger using WordPress. Hmmm I’ve never tried that plugin, but I assume it has similar features as plugins like All In One SEO Pack and Yoast. Those kinds of plugins do help with all kinds of useful tweaks. Learning SEO with your previous blog probably made it a lot easier to do things right with your current blog. I do have to say that it seems to be doing extremely well so far. Yoast is the WordPress SEO plugin. Everyone just calls it Yoast, but that’s the official name. Thanks for the tips! I definitely get lazy when it comes to SEO, but these seems like pretty easy ways to stay on top of things. Some SEO is quite straight forward such as keyword usage. It is just a matter of getting in the habit of doing it. Then as your blog builds up a stronger link profile, you can gradually put more focus on it. Just try to learn things early on so that you don’t have to learn it all later and realize you were doing some things less optimized in the past. lol Bobbie. Well I like Tuesdays for being able to geek out writing my blogging tips post. It’s enjoyable sharing these tips, especially knowing that some of this stuff will help my blogger friends. Thanks for the excellent advice. I recently read some stuff about this topic and I didn’t really know that you could use the image title and alt title to add keywords. Other than that, I think I have most of it down. I may try to use my keywords in the h2 and h3 headings though. I haven’t really focused on that much. In your case you should definitely make a point of optimizing your photos. When you are using your own photos it is an easy source of extra traffic. Your recipe photos in particular might benefit a lot from that. Headings are a good idea too. If you’re not using your keywords in your headings, it might confuse search engines as to what your page should really be relevant for. Great advice on easy SEO techniques. Thanks Sean. Some of these tips posts will be fairly basic, but they’re sure to be helpful for someone. I don’t want to overwhelm people with the more technical tips coming up. I’m glad I’ve got the SEO pack plugin, I think it helps. And I’ve finally learned to do a better job titling the images I use — that’s a great tip! I hate to have to think about SEO stuff becaus it makes me feel sorta fake or like a sell-out, but it’s really the best way to get people to your site. A lot of people feel that way about SEO. They think they should just be writing for their visitors. Really though it is pretty easy to just slip some keywords in without it looking unnatural or faked. The best SEO is where you are satisfying Google without visitors noticing at all. I’ll talk more about that in the 3rd part of this series. YES! For once, I read your advice on blogging and found that I got (almost) everything right! Since your last post on keywords, I’ve been researching them and using them like a madman. The only time I don’t (but this may change) is when I do my weekend wrap ups – those posts are usually too short and sweet to really target anything crucial. I wouldn’t worry about optimizing every single post. I generally don’t bother optimizing my weekly update posts. In fact in my last post I used the keyword ‘crotch shot’ in the image alt text. I have no intention of trying to get traffic from that keyword though lol. Think in terms of which posts will be most helpful to search engine traffic. If search engine traffic won’t get any benefit from the post, it will just negatively affect your user metrics. Thanks for such a helpful and informative post. I am new to blogging myself and know that there is so much to be learned about SEO and using it as a tool. Now is the best time to start learning SEO, but don’t expect much results from it until your blog builds up lots of backlinks. The earlier you start learning though, the easier it will become to consistently do things right in all of your posts. Good tips as usual. Using keywords in my page title and throughout the post is something I think I do fairly well. I don’t research specific keywords or anything, though. I kind of just wing it and use terms I would search for. I know I could do better though. As your blog builds up I would try to focus more on keyword choice. Everyone assumes they know how people search, but different people use search engines differently. By using keywords that you wouldn’t personally search for, you can usually target a keyword that is less competitive. I love the detail of these posts Jeremy. I actually don’t focus much on keywords. I find they seem to come naturally to me. However, I do use titles and URL’s as a way to attract readers. Another way I like to emphasize certain words or phrases is using lists. This allows people to focus on it. Your blog may have built up enough strength to target the more natural keywords. Some blogs do need to focus on less competitive keywords though. I suspect that most established bloggers would have this basic stuff covered, but my post week should be more helpful for bloggers who already have these basics covered. Most blogs can usually improve traffic by targeting better keywords. So I wouldn’t just assume you have it covered well. I totally agree. I guess I just have a hard time targeting. I like to write about things I think matter regardless of whether they index well. It is a focus I need to adjust. I try to use some of those guidelines as long as my post continues to sound natural. If it sounds unnatural I will cut back on some of the items until I am satisfied. That’s the key, that you use strategies like this without it sounding unnatural. If you turn off your readers, then your efforts are just backfiring. I have started to implement a little keyword research, but this really silidifies what I need to be doing. Thanks again Jeremy! One thing that I have been doing, though, is putting the title of my post in the image header. This is because when my wife shares through pinterest, she doesn’t have to changes the topic heading. I don’t know if this really matters much, because I don’t get a LOT of pinterest traffic, but it’s just something I’m trying out. Glad to hear this post is solidifying things for you. Next week I’ll try to step it up further and give some tips that will really give you a decent boost. In the meantime just keep working hard getting links to your blog. As that builds up, your search engine traffic should pick up too. Thanks for these tips Jeremy. I’ve read a about keywords before but I’d always walk away from the article feeling a little confused as to what the most important elements of where to use the keywords. You’ve cleared that up for me. I’ll be able to use keywords more effectively now. Any yes, I still need to work on your suggestions you gave me for my site. I’ll get around to it, I promise! I do try to make these blogging tips posts clear for the average blogger. I know a lot of the SEO advice out there can be a bit intimidating with all the jargon used. Of course anyone is welcome to e-mail me if anything wasn’t clear or you can ask in the comments. Good luck implementing the changes I suggested. I know a blog to do list can really build up and never really clear completely. Jeremy! Great post and great structure. Hopefully this post will itself bring you traffic on the subject. I must admit I learned a few things too. lol for some reason it seems it’s only my blogging tips posts that have any kind of proper structure. Some extra traffic would be nice, but I’m happy just helping out blogger friends. It’s in my best interests to help them all succeed. Genuis info once again! Definitely will be using and bookmarking. I’m trying to think of other stuff to say to make this qualify as a good comment :p, but I was so in the dark before reading this that all I can do is say THANK YOU. I don’t know for sure whether numbers would dilute the keywords or not, but you’re probably safe. Aesthetics-wise it doesn’t look very good to have long urls like that though. In search results they would have to truncate such a url. When possible, I always prefer a shorter url. If you do change your permalink structure be sure you have redirects setup. I’m surprised you have a SEO book. It’s the kind of industry that is changing rapidly enough that it would be tough to publish a book that remains relevant. That’s what I like most about Yoast’s WordPress SEO plugin, it will tell me how many times I’ve used the keyword I’ve told it was my target keyword and where it is. Hmmm I didn’t realize Yoast does that. I looked into Yoast and gave it a try early on with this blog, but it was missing something that I use in All In One SEO Pack. I think it only makes sense to use one of those plugins since so much of the functionality is duplicated. Curious to hear what it was. I tried installing All-In-One when I redid If You Can Read, You Can Cook but it seemed very stripped down compared to some of the features I’m used to in Yoast. I assume Yoast has just continued to improve since I tried it and may have surpassed All In One SEO by now. I don’t remember what exactly led me away from Yoast. I am doing baby steps, but appreciat all the advice. I had no idea you should change the permalinks. That was so easy. Thanks! It is a rather easy change to make. If your blog was much older I would recommend you use a plugin that redirects the old urls. In your case though it is probably fine as is. We have been gradually getting better at SEO since starting See Debt Run six months ago.. We do pretty well on a few keywords, but not as well on others that we were targeting. One thing that I never thought to pay attention to was the name of the images that we are attaching.. Great idea! Images are great way to reinforce relevance. It’s something I’ve done for SEO as long as I can remember. Regarding not doing so well on some keywords, you probably just don’t have enough links to that specific post. My next blogging tips post will have some suggestions to help in those kinds of situations. I think that strategy is fine early on since it can result in more appealing titles and content. As your links build up though you should be doing what you can to take advantage of that domain strength. Good read and reinforcing tips. Thanks for including us! Great tips, Jeremy. I look forward to off-page tips from you as well. I believe that Google’s new algorithm is heavily on to off-page elements as those hard to fake. Do you agree? Google’s algorithm has been favoring offpage factors for many years now. In the last year or two they have started cracking down on certain factors that look spammy….both offpage and onpage. Search engine rankings are basically just a popularity contest, but there are plenty of hoops to jump through to get in on the ballot. Jeremy, I really like the idea of social sharing recognition. I can’t believe I’ve never thought of that before! Bravo! Thanks Veronica. I just figured it would be a good way to reward people for sharing. I can’t think of any other blogs who do that, but I guess it’s only practical for a certain period of a blog’s growth. Well, it’s brilliant! Do you mind if I try that on? 🙂 My blog is still new and it looks like I can learn a lot from your posts here! Lol of course you can try it out. I don’t hold copyrights to any strategies I use 😉 It might work well on my blog partly because it is PR4. So it gives people a bit more incentive. I read that there is a lot more value in marketing to people who can find information useful vs. marketing towards search engines. Someone also pointed out that social sharing has exceeded web traffic for some companies who care to contribute really great content. Personally I like to market towards search engines because then you can attract the people looking specifically for something that is useful to them right then. And yeah social sharing can be hugely beneficial if you can properly harness it. I’m still learning the ropes there, but I think what I’m doing so far is at least helping my blog’s search engine strength. As I get better at producing good content I figure my existing network should help my content spread a lot easier. I love finding blogging tips that aren’t written in gibberish. I don’t pay enough attention to my SEO, sometimes I fill out some stuff and include keywords, but not very often. Definitely put more effort into SEO if you can, especially the offpage stuff. You need domain strength to be able to take advantage of the keywords you target. Of course with blogging you can get a lot of traffic just by being super active on other blogs. That tends to build up lots of quality links too. Thanks for the tips!!! I will be implementing them in my future blog posts! Good to hear that you’ll be using these tips. Hope it helps you build up more traffic to your blog. Just don’t expect to rank well for keywords early on. This I must say is a very relevant and informative post especially for new bloggers like myself who want to get traffic to their blogs. Some of us get carried away stuffing our posts with keywords that are not relevant to our target audience (niche) and end up in the wrong search results and wonder why no one seems to be reading our posts. I am most impressed by the idea of sharing posts on social media to drive traffic to my blog. Never thought of this before and I must say I will definitely try it out. Will be a regular visitor here as I am sure I will benefit greatly from your insights. Yes there isn’t much point in stuffing irrelevant keywords into your posts. That may have been useful in the past, but now that just messes up your user metrics. You’re better off focusing on keywords that can actually help you. Nice post.Actually,One of the most important components of SEO is choosing suitable keywords and properly using them on your blog. Lots of people overlook that simple fact. They get so caught up in building links and writing content that they forget the importance of quality keywords. Thank you. With my little experience I learned that keyword placement is more required than building backlinks. I know the points already, but your post looking very fresh. I wouldn’t say it’s more important than building backlinks at all. That is how SEO was in the early days, but now you’re not going to get very far only worrying about keyword placement. Link building is much more required.